A Cookstown man has pleaded not guilty to causing death by careless driving in relation to the incident that left local teenager, Charly-Jean Thompson, dead in August 2013. Lee Walter Hegarty from Molesworth Road, Cookstown, denied the charge before Dungannon Crown Court on Friday, March 4. 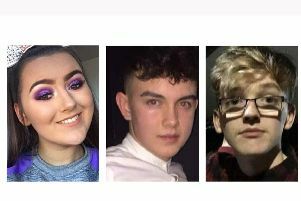 He is being tried on one count of causing death by driving a mechanically propelled vehicle on a road, namely the Drum Road, Cookstown without due care and attention on August 14, 2013. The 24-year-old defendant also pleaded not guilty to a second charge that he caused grievous bodily injury to Ryan McCracken by driving a mechanically propelled vehicle on a road, namely Drum Road, Cookstown without due care and attention. Speaking for his client, defence counsel Des Fahy said a statement had been drafted and served in relation to the charges. The court was then told that the defence would be seeking an expert report in relation to the mechanics of the alleged incident and the layout of the road in question. It was also revealed that the case might last for a week, after which Mr Fahy applied and was granted leave for a senior counsel - given what is involved and the nature of the charges against Hegarty. Judge Paul Ramsey adjourned the case until March 21, telling the defendant that he had no necessity to attend on that date. The judge said the trial should begin in “May or June, all going well”.